In a previous post, I introduced a project that my marine management class at Dalhousie University has developed in tandem with Nova Scotia’s Clean Foundation to study marine pollution in the Halifax Harbour. Today I want to expand on that introduction and discuss some of the major socio-cultural factors influencing marine waste inputs and patterns of ocean pollution, from a local-to-global scale. As part of this discourse, there is a significant GIS-link in data collection techniques related to marine pollution, which I will explain closer to the end of the page. First, a bit of history. To understand marine pollution and the scale of anthropic impact on global ocean systems, it’s important to first know a little bit about the relationship between people and waste. It’s a complicated narrative, and there are many moments throughout the development of human history one could point to in delineating fundamental shifts in the way that various societies interact with their refuse, but for the West, the industrial revolution provides an appropriate starting place. It’s the tail end of the 19th Century in North America. The industrial revolution has led to an influx of wealth accumulation across the Western world. More and more people are leaving the traditional, rural lifestyles that have characterized much of the human experience up to this point, moving to cities and urban centres in search of greater economic opportunity and a chance at a better life. A defining component of the urban landscape is a great variability in social class. In the city, some have, and others have not; economic continuum provides the fabric on which urban society is shaped. One of the features most commonly associated with wealth and status in Western culture at the time is the accumulation of material goods. Those who can afford to buy, buy. Material possessions come to act as a proxy for power; a marker of success in rapidly developing systems of capitalism. Much-less discussed, the by-product of this near-ubiquitous increase in urban consumption begins to build steadily. In the countryside, organic waste goes back to the land, decomposing over time, without concentrations large enough to cause any serious waste management issues. In the city, infrastructure is developing at a breakneck pace to accommodate new urban dwellers. The manufactured landscapes and hard surfaces of the metropolis inhibit processes of natural decomposition. Population continues to grow, and waste starts to flood the streets of North American cities. Civic leaders, attuned to their metropolitan environments begin to recognize the problem of waste build-up as a significant barrier to commerce and the efficient movement of goods and services through city. Garbage begins to transition from the quiet closet of “personal affairs” and private responsibility to the arena of political discourse and public works. In response, government waste management plans begin to appear in various forms across the urban centres of the West. At this point, waste products are still primarily organic in origin, and disappearing trash requires little more than a system of regularly scheduled transport to the uninhabited margins of settlement. A clearing in the woods; grasslands void of agricultural; inhospitable or un-livable terrain; the ocean; cost-effectiveness and “out of sight, out of mind” principles dominate the development of public waste plans through the early 20th Century. The foundations on which waste management strategies are formed become crucially important after the First World War, when the nature of urban waste begins to change. Austerity measures and advances in assembly-line technologies aimed at quick and efficient production processes set the stage for the development of goods en-masse. At the same time, advertising is becoming a well-recognized method for more profitable commercial enterprise. Developing trade systems and advances in packaging, preservation and shipping allow for an easy transport of goods from one end of the North American continent to the other. Suddenly, packaged goods delivered to urban centres provide an opportunity for advertising, and companies begin to enlist packaging technologies for brand-building purposes. After the Second World War, the nature of waste undergoes its third monumental shift. Further improvements in assembly line efficiency and the mass production of goods come to typify the manufacturing sector in North America, particularly the United States, in the late 1940s and early ‘50s. This time, however, there’s a twist. Plastic, under development for several decades at this point, becomes a highly coveted production commodity because of its low cost and versatility. Plastics companies pitch convenience to consumers: no more repairs, no more cleaning, no more hassle. Plastic products are so cheap that buyers can use them once, throw them in the trash and pull the next Dixie cup or Styrofoam plate out of the box without worry. The industry even goes so far as to align itself with the women’s suffrage movement, gaining ground at the time, pitching plastics to housewives and would-be working women as a commodity meant to save household labour and allow more freedom. A 1955, America’s popular Life Magazine ran a story titled, “Throwaway Living: Dozens of Disposable Housewares Eliminate the Chore of Cleaning Up.” Just like that, the culture of cheap, disposable goods, which still largely defines Western consumerism today, is born. Three children tossing paper cups, plates, aluminum foil pans, lunch trays, straws and napkins through the air illustrating the usefulness of disposable dishes. 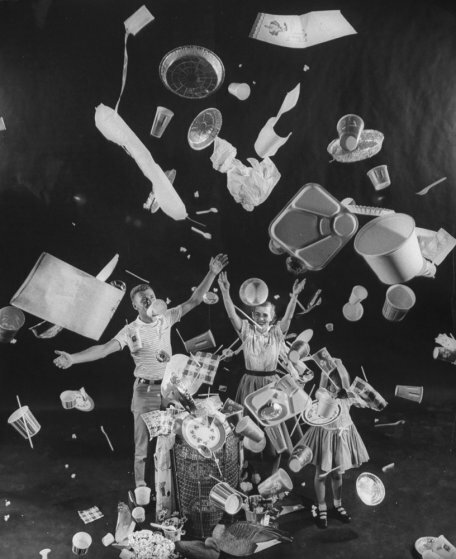 A photo from Life Magazine’s 1955 story titled, Throwaway Living: Dozens of Disposable Housewares Eliminate the Chore of Cleaning Up. Photo via Time Magazine. Running through this historical thread is the economically problematic nature of waste itself, and its place in free market systems. Waste, in its truest form, does not generate “new value,” and thus is often left out economic theory. For large industrial players like those who make plastics, considerations for waste generated after consumption are rarely included as part of production or accounting processes. This exclusion is reflected in the way markets often allocate the cost of waste to consumers. Instead of producers paying proportionally for the public services that deal with, for instance, packaging waste, buyers pay manufactures built-in fees for packaging at the cash register, and government for waste management services, in taxes. This arrangement creates little financial incentive for producers to reduce or avoid packaging, as ultimately consumers, and then taxpayers, are left to pick up the tab. As European powers recover slowly from the Second World War, by the 1960s, the United States is widely regarded as the richest and most powerful nation on Earth. Globalization and free trade work to export American capitalism to nearly every financial marketplace on the planet. Global shipping systems come to characterize the Western shopping experience over the course of the next several decades, and packaged goods circumnavigate entire oceans from producers to consumer as multi-national manufacturers and large commercial enterprises source cheap labour for production across the developing world. At the same time, many countries in the often less-wealthy Global South push for sustaining democracies, free markets and access to the goods and services available in modern capitalist societies. While the development of cheap consumer products sprints forth through the 1990s, and into the new Millennium, forces of globalization allow for their proliferation at a planetary scale. Waste management systems lag significantly, laughably behind. Developing nations build wealth quickly, but are ill-equipped, with little or no municipal infrastructure in many cases, to address the massive influx of disposable goods and ubiquitous, non-biodegradable plastic products. As a result, much like the metropolitan centres of early 20th Century North America, waste begins to dominate the urban landscape, and exponentially increasing amounts are released into the ocean through storm drains, runoff, spillways, dumping, and points of entry leading from city to sea. While some of these inputs decompose over time, plastics don’t, simply breaking down into the tinier and tinier fragments that now pervade nearly all the world’s oceans to varying degrees. Today, marine environments suffer through significant impacts at the hands of land-sourced plastic waste products. Mismanaged waste, or that which is not subject to established management systems, counts for proportions upwards of 80% of total waste production in countries like Sri Lanka, Indonesia and the Philippines. In Manilla, for instance, in which an average person produces 0.7 kilograms of waste per day (versus a 0.3-kilogram global average), only nine of the sixteen municipalities comprising the greater metropolitan area have public waste management plans. About one third of Manilla’s total waste production falls into the non-biodegradable category; rubber, ceramics, scrap metal, plastics. Light, mobile, easily-fragmenting, floatable plastic products represent the greatest potential to harm marine environments because of their unique ability to hover at the water’s surface, sailing their way across the world through systems of ocean circulation. In a coastal nation like the Philippines, all waste not transported directly to landfills or recycling facilities has a clear pathway to the sea. Recent research estimates that some eight-million metric tons of plastic enters into the ocean annually. That’s about eighty Nimitz-class aircraft carriers, the largest warships in the United States’ Naval arsenal, shredded in their entirety to tiny, near-microscopic pieces and spread across the Earth’s waters every year. Over the past several decades, marine pollution has become an omnipresent issue, and an exceedingly difficult one to solve, advancing insidiously at incredibly challenging scales of the microscopic and the planetary. As we grow progressively more aware of the many harms caused by plastics and other ocean debris, increasing efforts in research attempt to further understand the problem, clean up aquatic waste, and slow down both land- and sea-based inputs. Perhaps unsurprisingly, GIS plays a major role in many of these initiatives. From the tracking of ocean waste as it travels through the ocean, to geographical hotspots in which marine species and seabirds are most significantly affected by surface plastics; from recording washed-up waste products on beaches across the world in app-supported open-sourced databases to citizen science campaigns, GIS has become central to the future of marine pollution research, activism and policy. Similarly, at Dalhousie’s Marine Affairs Program, we have begun the set-up of a long-term data collection program to monitor marine pollution at a local level. Using five separate sites for study around the Halifax Harbour, our class split into groups to investigate the state of the area’s shorelines, in an effort to examine incoming and outgoing waste products, and determine what they are, where they’re coming from, and why. The study sites chosen were largely areas high in public traffic, and theoretically of some significance to Haligonians for continued use, or aesthetic values, varying across locations. Understanding exactly who uses the designated areas and for what purposes became an important question to consider. My group studied the renowned Point Pleasant Park, once a coastal defence battery tasked with defending the Halifax from various enemy factions since its mid-18th Century inception; now a large piece of forested land at the southern tip of the city’s shoreline peninsula, cut by a maze of pedestrian trails and historic landmarks at which locals walk their dogs and summertime tourists flock in droves. A model representation of Black Rock Beach at Point Pleasant Park. Four quadrants dominated by different types of waste, clockwise from top left, rubber and miscellaneous, cigarette butts, plastics, and cigarette butts again. Photo by Simon Ryder-Burbidge. Point Pleasant has always been a high-use area, and in examining the sandy Black Rock Beach – used primarily for swimming when local e. coli levels are not harmful – we hoped to determine which of the waste products found were coming from pedestrian passers-by, and which were washing from the water. We divided the beach, about 800 metres-squared, into a four-part transect, and combed the kelp- and Irish moss-laced sediment for even the tiniest detectable pieces of waste. 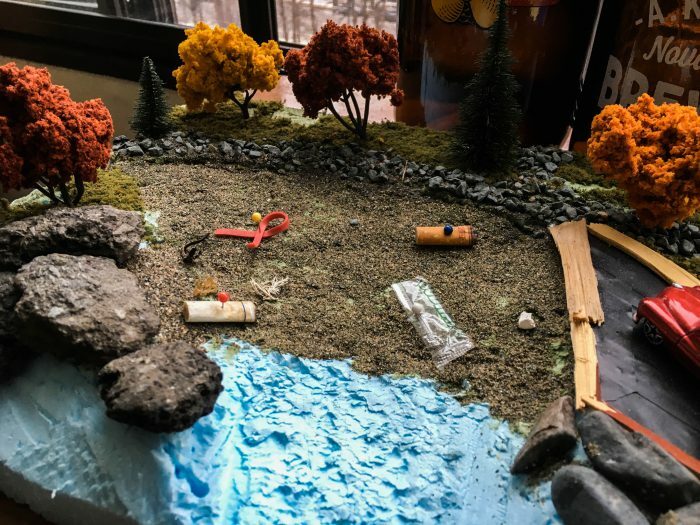 Over both searches, we came across an array of trash types, including plastic shards, various metals, foam, fishing gear, toy remnants, shreds of old clothing, fragmented glass, and hundreds of used cigarettes, just to name a few. During the counting process, we separated each piece of waste into categories, to get a better idea of what the location of each individual element could say about its point of origin. For instance, we expected we’d see more cigarette butts closer to the walking trail at the western edge of the beach, and prediction proved correct. After sorting, we input the locational data of the collected waste products into ArcGIS. We then mapped our findings digitally, overlaying surrounding features, such as pedestrian trails, garbage bins, recycling and compost infrastructure, nearby zones of high recreational use (i.e., areas designated for picnic and barbecue), signage and parking areas, among others. As part of this process, certain findings jumped out at us immediately. First, along the park’s largest and most well-used walking trail, around the extent of the peninsula, we found more than two kilometres of distance between available recycling and compost bins. While there were several of garbage bins in between, it was clear that recycling was to be an unlikely outcome for anyone wishing to avoid walking significant distances with their waste. More concerning still, several underserviced and overflowing garbage bins, including one immediately adjacent Black Rock Beach, with products of plastic and Styrofoam protruding from the cylindrical cans. Finally, no signage or information anywhere within the park to encourage users to carry out recyclable products or properly dispose of cigarettes. While these may seem like small injustices, in aggregate simple measures can often make big differences in the effort to mitigate marine pollution. As our Point Pleasant Park study-group and others at different harbour sites began to interpret respective data, our next step was to bring our findings together, decide how to best communicate the information and determine recommendations that city officials could consider in facing the challenge of marine pollution in Halifax – a city whose motto reads “E Mari Merces,” or “From the Sea, Wealth.” In future posts, I’ll describe how that process took place, the GIS elements involved in translating and depicting data, and the opportunity we had to present our finding to Mr. Mike Savage, mayor of Halifax. Stay tuned, more to come.